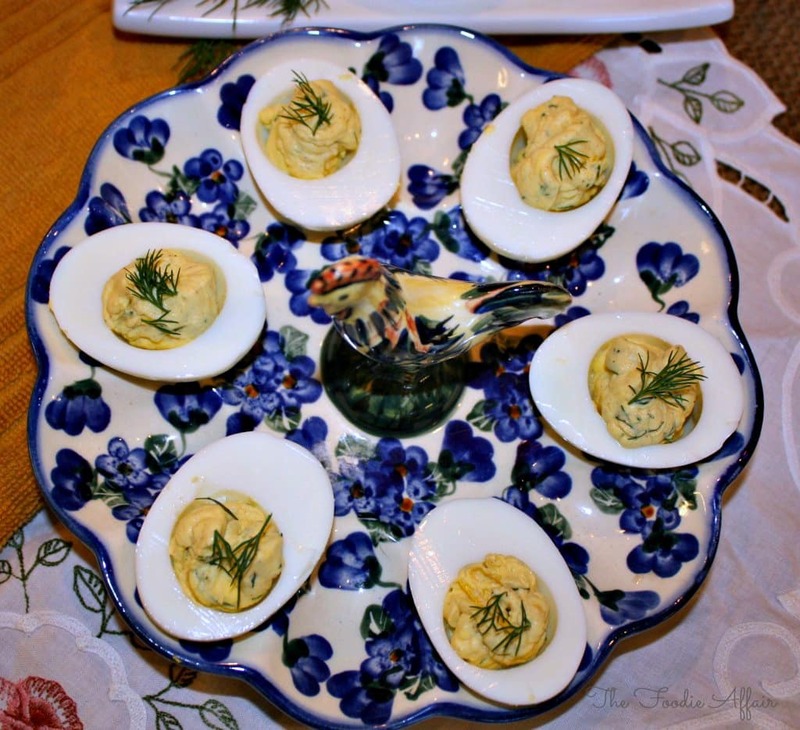 Dill Deviled Eggs made with fresh delicate dill leaves and Greek yogurt. After the excitement of decorating and hunting for Easter eggs, there is going to be a lot of hard boiled eggs leftover! Those pretty colored eggs get pushed aside in favor of peeps or chocolate bunnies, so back to the refrigerator they go! 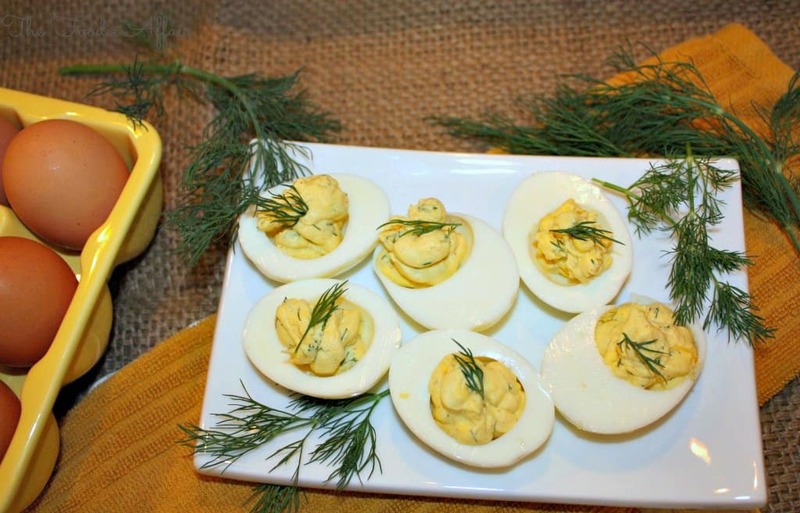 The most popular post Easter dish people whip up after the holiday is egg salad or deviled eggs. We eat eggs just about every day, but only make deviled eggs a couple of times a year. 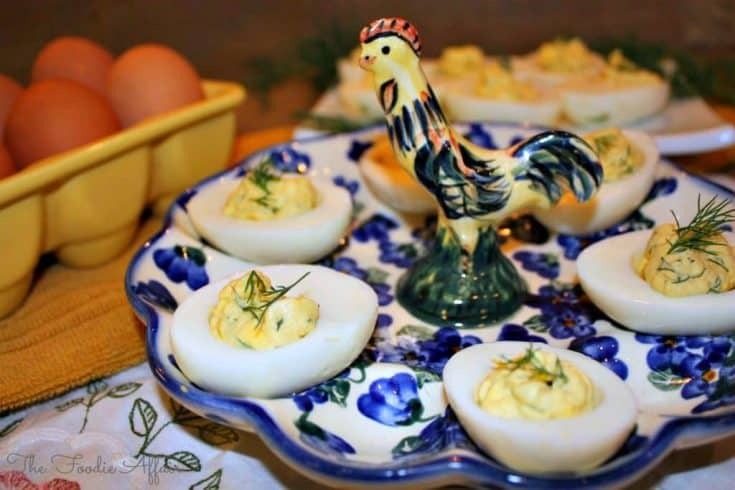 You can get super creative with the filling when making deviled eggs. Have you tried these smoked salmon deviled eggs? They are as tasty as these Dill Deviled Eggs and they both pack up well for breakfast, lunch, and snacks on the go! Alan and I have experimented with lots of different ways to boil a perfect egg because we eat them everyday. We’ve added vinegar, cooked older eggs, tried cooking with fresh eggs, added salt, and we’ve even baked them in the oven! They all turn out fine and they’re eatable, but not perfect. “Umm…hey, babe, you know that last egg you took? Well, I don’t think it’s a hard boiled one!” Whoops! Well, I think the science project may come to an end! This last batch of hard boiled eggs turned out beautifully! The shell peeled nicely, the egg was a creamy yellow, no gray patches or dry yolk! 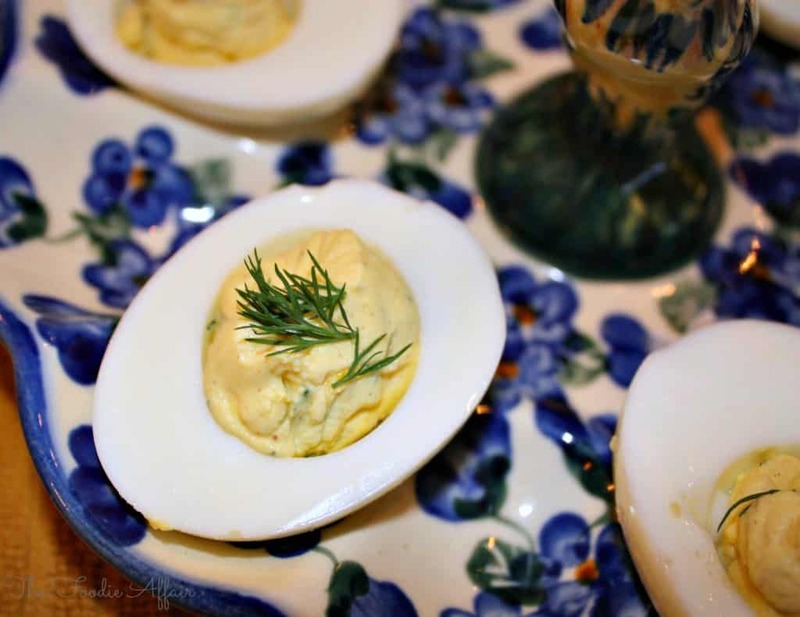 How to boil perfect eggs for these Dill Deviled Eggs! This is how I did it. I put my six eggs on the bottom of a pot. Not on top of each other. One single layer. Cover the eggs with water until it reaches about an inch above the eggs. Cover the pot and bring it to a boil. As soon as it boils, remove the pot of eggs from the heat and let sit for 12 minutes. Drain hot water and put the eggs in a bowl of ice. Cover the eggs with more ice. Let sit for 10-15 minutes. That is the method to my perfect hard-cooked eggs! What works for you? Did you know that the term “deviled” in reference to food was first used in the 19th century to describe a dish being spicy? Yeah, I learned that from Wikipedia. I find it interesting that mustard was a condiment with enough zest to be considered spicy! 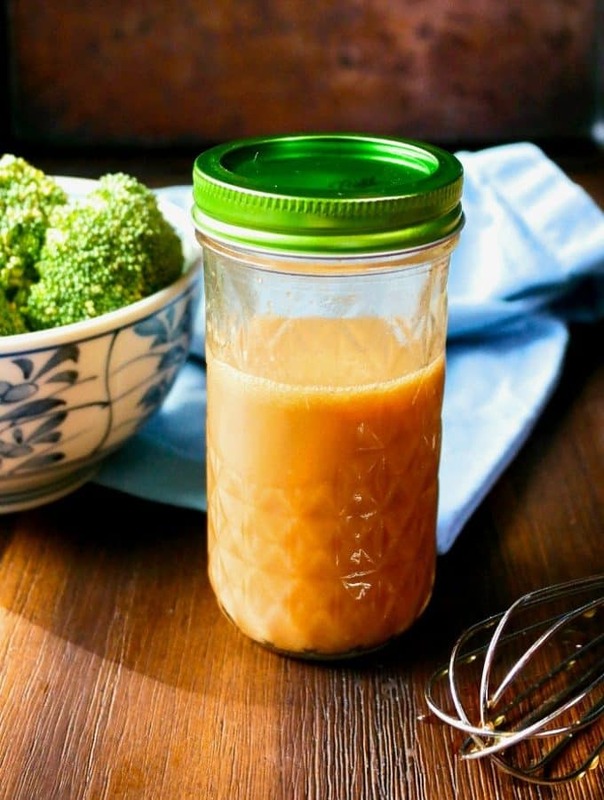 Adapted from Martha Stewart, Everyday Food by Sarah Carey. Peel eggs and halve lengthwise, removing the yokes. Place yokes, yogurt, mustard, lemon, dill and salt in a small bowl. Mash ingredients together until smooth. Pipe or spoon mixture into the egg white halves adding a small sprig of fresh dill. Delicious looking devil eggs. I could have 2 for breakfast now. Love you egg dish. Okay, so I’m going to give your egg boiling method a try. Sometimes my eggs come out fine, and then some times not so good! I absolutely love deviled eggs, but I’ve never made them with yogurt before. Thanks for sharing. I hope my new found egg boiling method wasn’t a fluke and works well for you too! I’m not a big fan of mayonnaise, so substitute with Greek yogurt a lot. The yogurt and dill must give a nice fresh taste to the deviled eggs. Yes, it has a refreshing zing to the filling. It’s not heavy and the yogurt adds a bit more protein to the deviled egg. Hi Bam! I did have my blog on WordPress. I transferred to a self hosted site, although some of my readers didn’t transfer smoothly. I’ve never really liked mayo based dishes, so super thrilled the yogurt works so well with this dish. Thank you for stopping by! 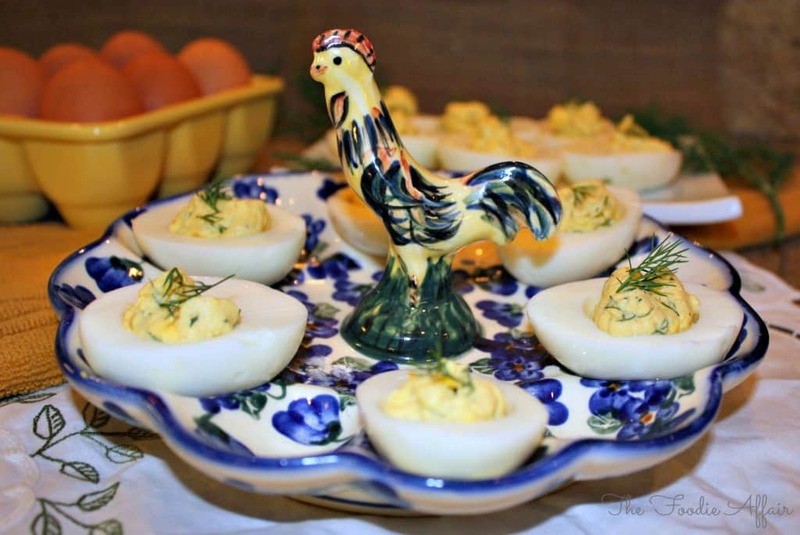 Love, love love deviled eggs!! And I haven’t had them in a while…I may need to make some soon! Thanks! Thanks for stopping by! I subscribed to your blog so I won’t miss your postings. I lost you in cyberland! The eggs will be a nice addition to a GF diet! YUUUMMMMYYY I can’t wait to try these! 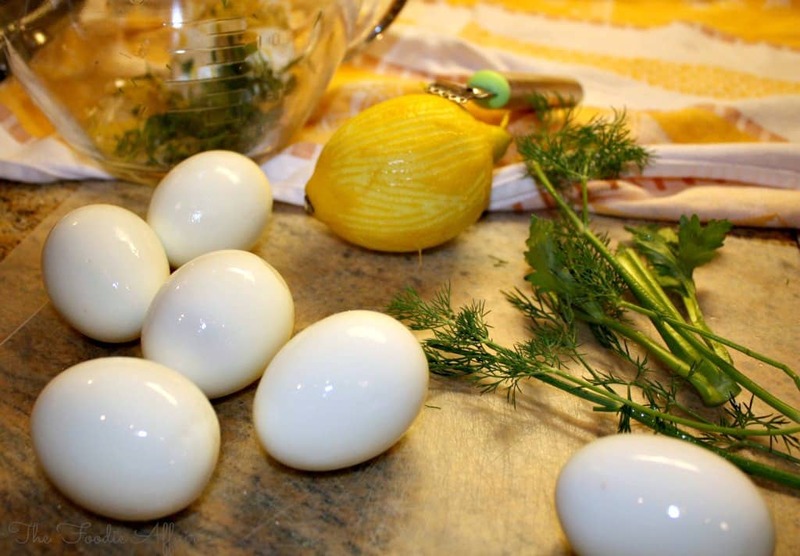 Fresh dill and eggs…perfect together! IDK why, but I only tend to enjoy deviled eggs around Easter. I should make them more often, because I really like them. I’m with you, we need to make deviled eggs more often! Those look so good. Going to have to get some fresh dill and try them. The boys all love dill, too. Good to hear that your family all like the flavor of dill! It’s one of those risky spices. Fresh is amazing though!! Oh, and I love that egg plate!